Devon and Cornwall feature some of the worst places in Britain for whale, dolphin and porpoise deaths, according to new Natural History Museum figures. The number of whales, dolphins and porpoises stranded on UK shores has more than doubled in the past 10 years. Cornwall's Mount's Bay, Whitsand Bay, Looe and Gerran's Bay, and Thurlestone in Devon, are some of the worst areas. The strandings are thought to be caused by sickness, disorientation and accidental capture in fishing nets. Strandings have increased from 360 in 1994 to 782 last year and Cornwall has the highest number of reported strandings in the UK. 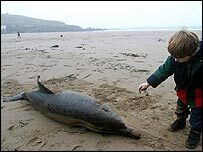 Figures for 2002-2003 show 250 cetaceans were found dead on Cornwall's beaches while 80 were found on Devon's shores. The government has banned UK pair trawlers - blamed by environmentalists for many of the deaths - from British coastal waters in a bid to save dolphins. Pair trawlers hunting bass drag huge nets between them in which dolphins can accidentally get caught and drown. The practice has been banned within 12 miles of the British coast since September 2004. But Greenpeace, which has been holding protests in the English Channel, wants the ban extended to 200 miles and has mounted a legal challenge in the High Court.